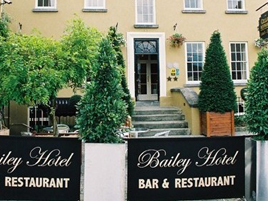 Baileys 4 star Hotel is a beautifully restored listed Georgian building ideally situated in the heart of Cashel town with private off-street parking. The fully licensed Cellar Bar serves food in a cozy environment with an open fire while superb bistro style dining is available in the restaurant, No. 42. Elegant rooms provide DD phone, interactive plasma TV with on-demand movies and free broadband internet. New luxuriously appointed suite now available. Live music playing in the Cellar Bar of Baileys every Saturday night. Different musicians each night playing a range of easy listening, trad, 70s & soft rock.